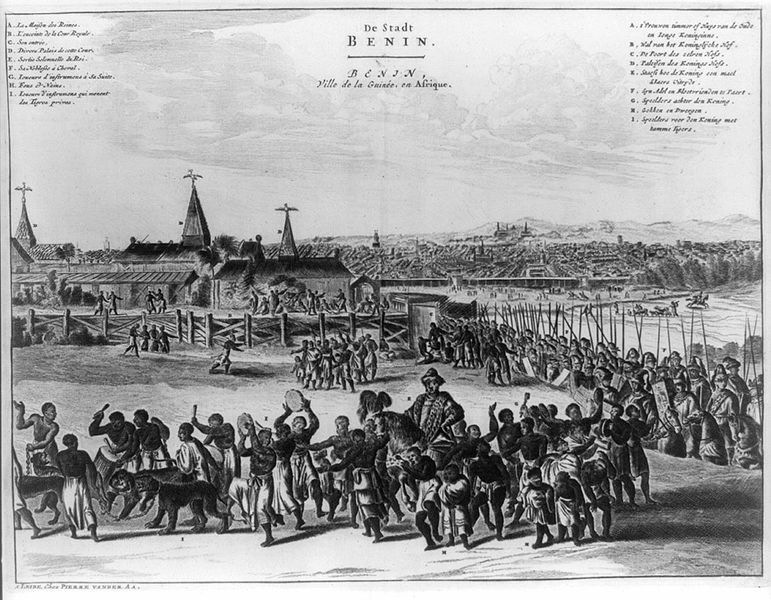 Engraving from 1668 showing Benin city. It shows the house of the queens in the back and the royal courtyard on the left. The king is in the center on a horse with mounted nobles on the right. "The king's palace or court is a square, and is as large as the town of Haarlem and entirely surrounded by a special wall, like that which encircles the town. It is divided into many magnificent palaces, houses, and apartments of the courtiers, and comprises beautiful and long square galleries, about as large as the Exchange at Amsterdam, but one larger than another, resting on wooden pillars, from top to bottom covered with cast copper, on which are engraved the pictures of their war exploits and battles..."